He created the 2008 “Hope” poster that helped Barack Obama become president. 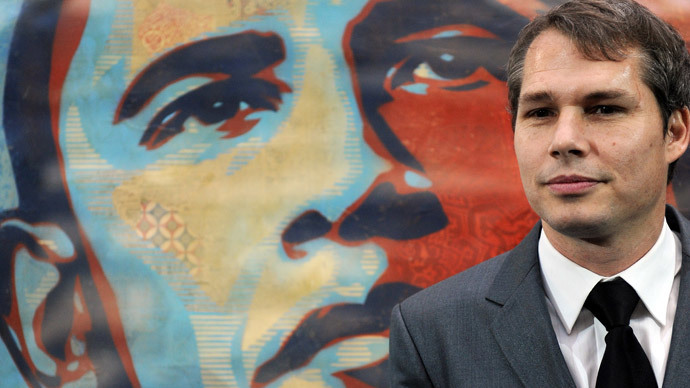 Seven years later, Shepard Fairey says Obama did not live up to his promise, and blames an out-of-control political system distorted by campaign finance. “Not even close,” Fairey answered when asked whether President Obama had lived up to the promise of his iconic poster, which embodied the Democrat’s successful “Hope and Change” campaign. The Obama-Biden ticket won almost 53 percent of the popular vote, almost 10 million more than McCain-Palin. Part of the problem, he added, was that the American public was “uneducated and complacent,” taking for granted a lot of things that made life easy and preferring finger-pointing to even the simplest actions that could make things better. A lot of his recent work is about issues arising from corporate interests being more powerful than the people, from environmental destruction to climate change. “I’m not anti-capitalism. Capitalism just needs better referees,” Fairey said. In 2009, Fairey and the Associated Press clashed in court over the “Hope” poster, as the agency claimed the poster was derived from one of their photographs and, thus, violated copyright. The case was settled in 2011, under undisclosed terms. A year later, a federal court in Manhattan fined the artist $25,000 and sentenced him to 2 years of probation on charges of evidence tampering. Fairey allegedly tried to cover up the fact that he used an AP photo. “What I am always trying to put across is that, when you have free speech and the ability to have a discourse about challenging things, you better exercise it,” he said.